SANFORD - Juan Guerrero smiles as he looks back over the past year. Back in April 2009, Guerrero was laid off from Coty. That's nothing to smile about, but he had seen the lay-off coming with the recession and already considered his options. "Competition for jobs was rough so I thought, why not start my own business?" he said. "The idea of doing that had been brewing for some time. I didn't have the courage or the know-how, but I felt the urge to make the leap when a choice had to be made." He made a leap in the right direction - into the office of Jim Felton, director of Central Carolina Community College's Small Business Center in Lee County. Felton specializes in helping would-be entrepreneurs in Lee County achieve their dream of owning their own business. Guerrero's dream was to have his own lawn service/exterior home repair business. "I grew up doing farm work - that's where my love for the outdoors was planted," Guerrero said. Felton has been working with and on behalf of small businesses in Lee County for more than 14 years. For this, the Sanford Area Chamber of Commerce recently named him its 2010 Small Business Advocate of the Year. "Juan had a goal and was willing to work very hard to achieve it," Felton said. "He just needed to know what to do to bring it to fruition. He has overcome a lot of obstacles and is excited about his future as a small business owner." Felton drew on his years as a small business owner and business advocate to assist Guerrero through the practicalities and legalities of setting up a proprietorship. He also directed him to N.C. Project GATE (Growing America through Entrepreneurship) where Guerrero worked with counselor Don Miller. Guerrero was able to obtain more training and a small grant to help him with start-up costs. Felton also sent him to Vocational Rehabilitation, which bought him a mower when his was stolen and provided other help. The N.C. Rural Center was also applied to for financial assistance and helped to buy him a used truck for his business. Having his own business was a dream Guerrero never imagined back in 1996 when, as a teenager, he was the victim of a shooting that left him paralyzed and unable to speak. With intensive physical therapy and speech therapy, he overcame those challenges and returned to Lee County High School, where he graduated in 2000. He attended college while working two jobs, at a retail store and in his uncle's landscaping business, where he was a supervisor. Guerrero decided to drop out of college, give up the two part-time jobs and take a full-time job at a retail store. That ended when he had a bad automobile accident and couldn't drive for a while. Still resilient, Guerrero worked at Lee County Industries, receiving vocational rehabilitation. In 2008, he landed the job with Coty, which ended with the recession. After overcoming so many challenges, Guerrero has now taken on a major one of having his own business. He's enthusiastic about what he can build it into. Guerrero's Green Knights Lawn Care Services offers a variety of services, including full lawn care and putting in yards from scratch, as well as pressure washing, painting, building retaining walls, and debris removal. He said he named the business "Green Knights" because he wants to incorporate environmentally friendly methods in his work. Also, a knight is known to be honest and trustworthy. The business can be reached at (919) 895-8581 or online at guerrero1@windstream.net. Guerrero continues to sit down regularly with Felton to review his business plans and goals. "I wouldn't be here if it hadn't been for the Small Business Center," he said. "It's been one year since starting and my business is growing. My key is having a customer and quality focus, doing the best job I can for the customer. "With patience and dedication, it's possible to live the American Dream," he added, smiling. "Ten years from now, I see myself with a crew of maybe four full-time employees. The business is for my kids' futures - if all goes well, they'll have a better life." Juan Guerrero, of Sanford, was laid off from his manufacturing job at Coty in April 2009. He immediately visited CentralrnCarolina Community College�s Small Business Center in Lee County with an idearnfor starting his own lawn care business. 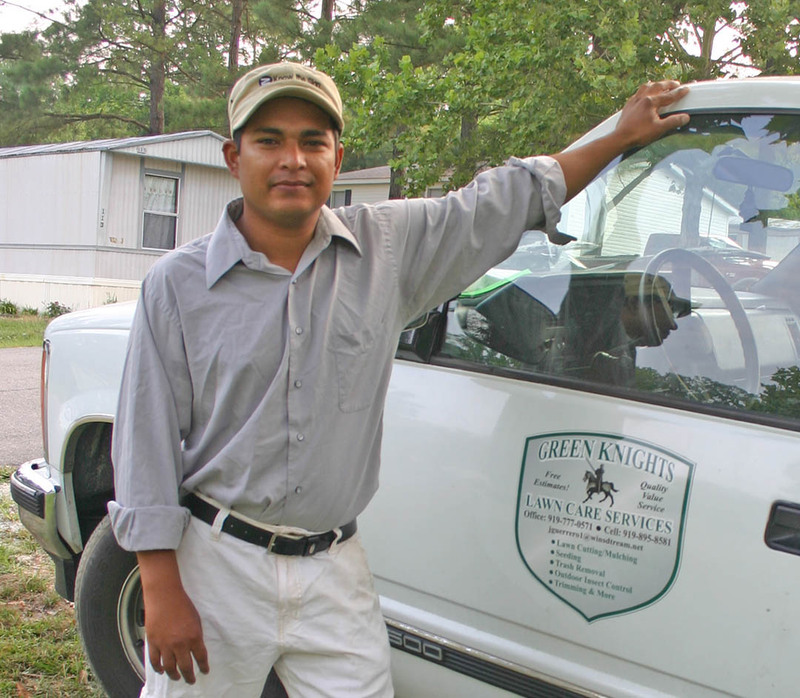 The help he received enabled him tornopen his business, Green Knights Lawn Care Services, in June 2009. A yearrnlater, the company is growing and has become a positive addition to Lee County�srnsmall business community. For more information about starting or running arnsmall business, contact the college�s SBC directors: Jim Felton, Lee County,rn(919) 718-7545 or jfelton@cccc.edu ; Gary Kibler,rnChatham County, at (919) 545-8013 or gkibler@cccc.edu ; or Nancy Blackman,rnHarnett County, at (910) 892-2884 or nblackman@cccc.edu .